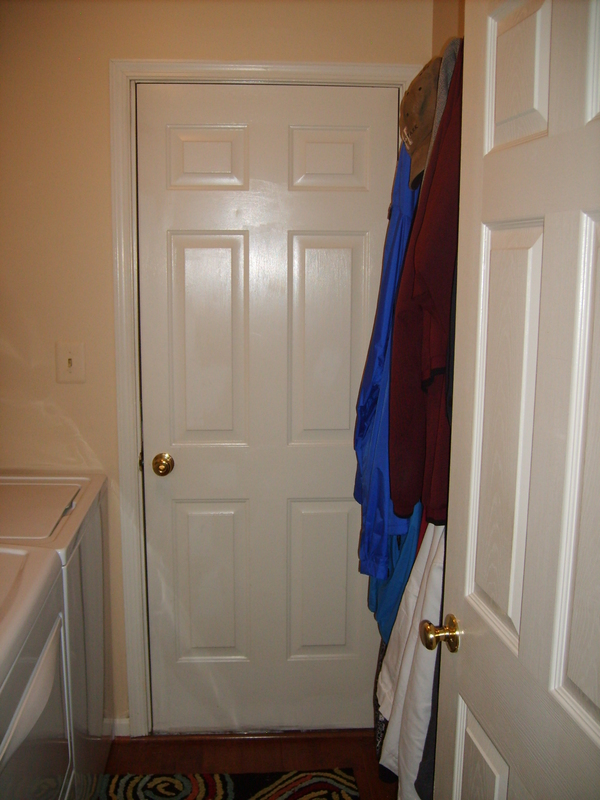 The summer issue of Getting Organized magazine has a great laundry room makeover article. The home owner only spent $157. If you want to revamp this very utilitarian space in your home it’s worth a read. I recently finished a similar project and wanted to share my inspired laundry room. 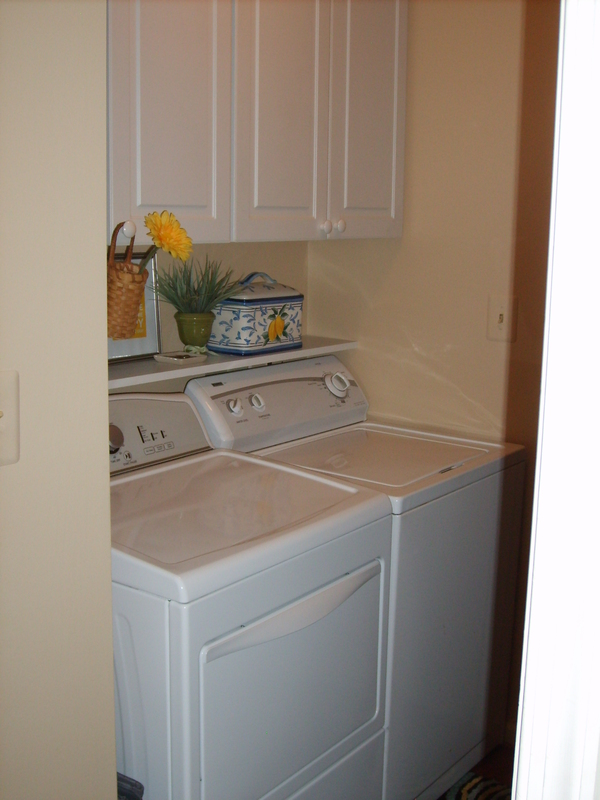 I have lived in my home for a long time and have always loved that my laundry was located on the main floor in the house. 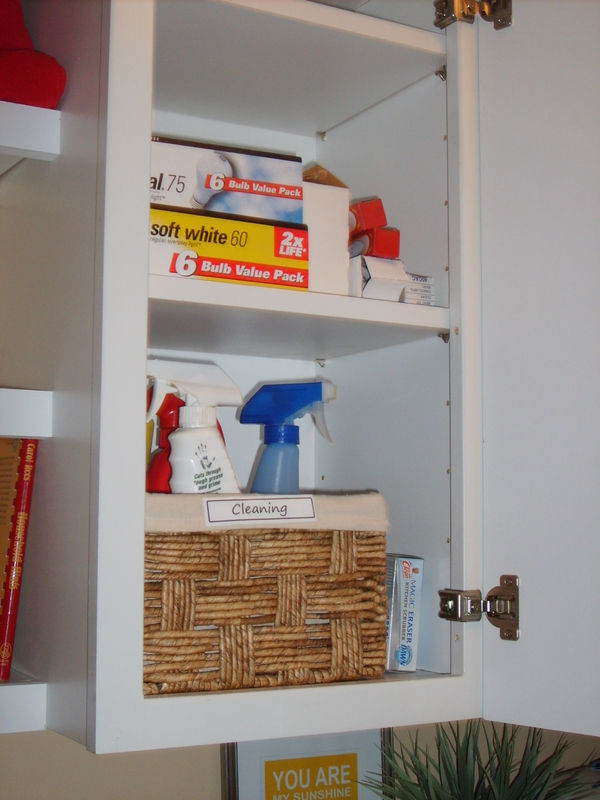 It made it easy to do the never-ending chore in small spurts when my kids where young. But the space was pretty uninspired. 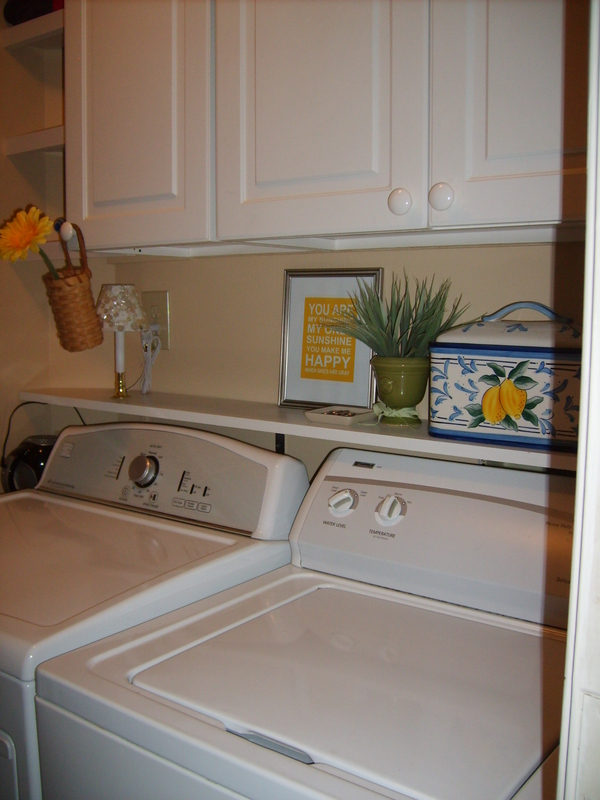 It used to have white wire shelves above the washer and dryer and white walls. Pretty basic, but did it’s job. I used to keep two of the same laundry baskets on top of the dryer (stacked inside each other) to toss in the soiled kitchen towel or the waiting load of laundry. It worked great at the time. We added the coats racks many years ago. 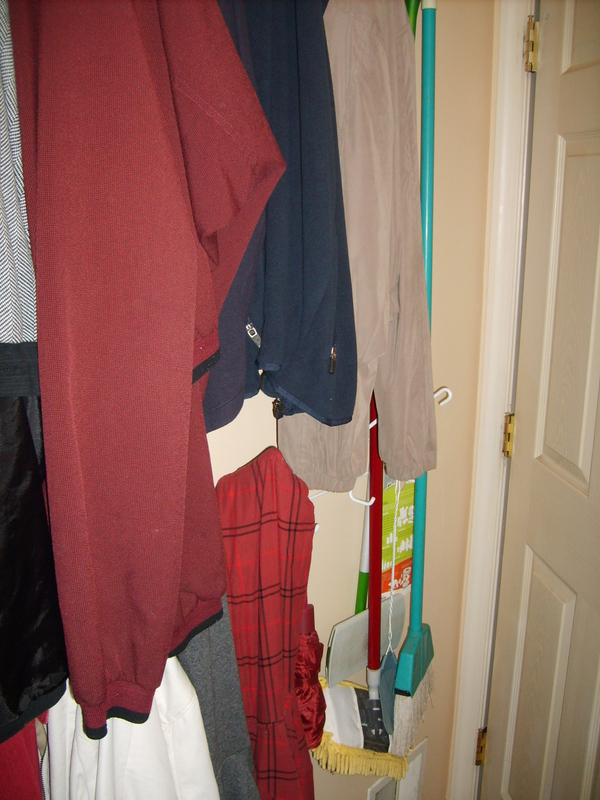 A wise idea, since our coat closet is small. The racks work so well that I didn’t change them. They even hold my brooms hidden behind the door. Here is what it looks like. You’ll see that the space is small and narrow, with two doors. It’s really a pass through from the garage to the house. Over the years our life style has changed. My kids do their own laundry and they usually enter and exit the house through the front door now, so I decided to make the laundry room a little more pretty. I like the idea because it’s a small project. But, also I thought it looked bad that this space, just off of our living area was so “undecorated”. We painted the walls a basic beige that we have used in other parts of the house. I then purchased the white cabinets at my local Habitat for Humanity Restore. $45 total! You’ve got to love the extra storage! My husband (the handy man he is!) made the small shelf you see just above the back of the washer and dryer. It covers the water cut-off behind the washer. He also added an electric outlet at the dryer. The shelf is handy to drop stuff, but to me it’s mostly for decoration. 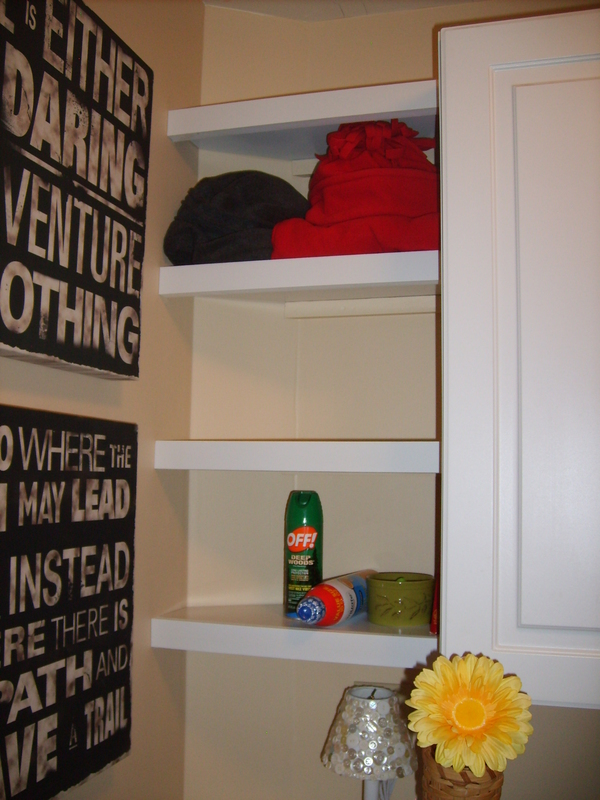 He also made the open shelves in the odd-shaped space that was leftover next to the cabinets. I hope you can see that there is an angled wall that he had to work with. A challenge, but don’t they look great?! I haven’t decided what to use the open shelves for yet, so they are just holding the odds and ends now. What do you think I should do? 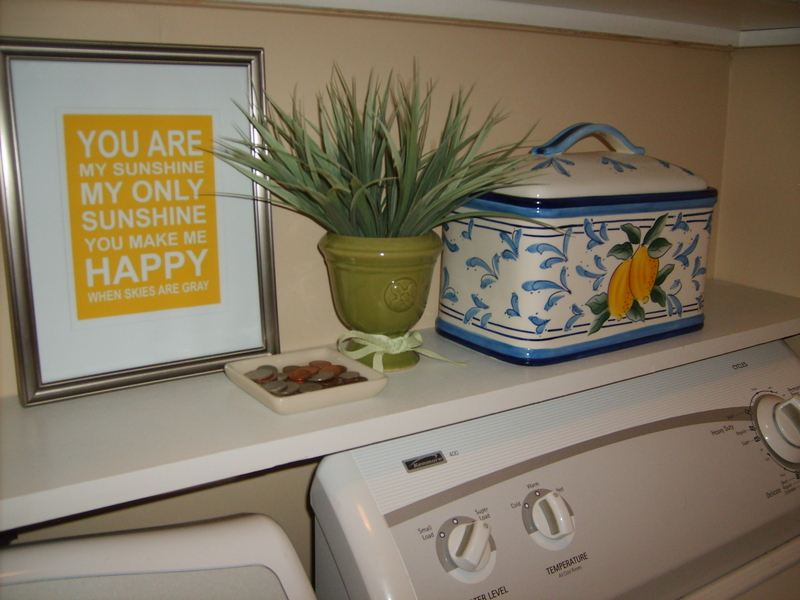 Check back in a few days for part 2 of My Inspired Laundry Room. 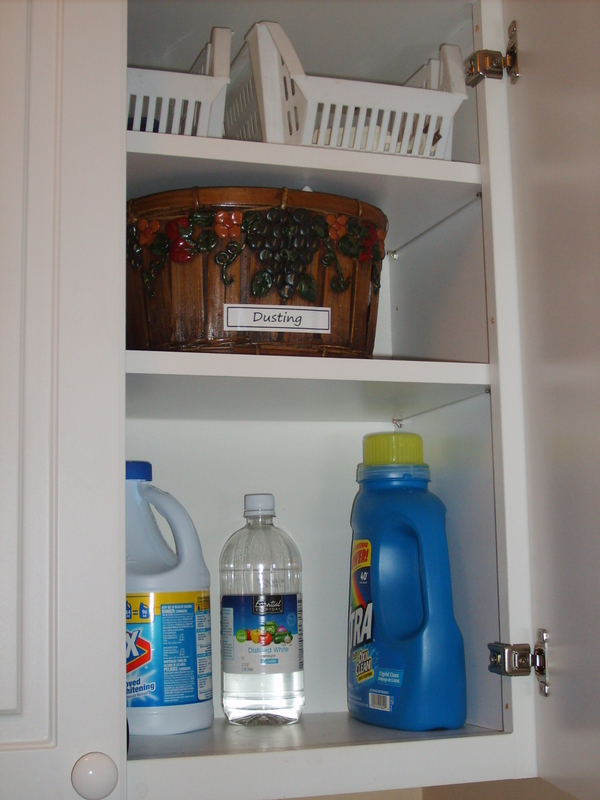 This entry was posted in Residential Organizing and tagged Inspiration, Organizing Laundry, Organizing Products, Projects. Bookmark the permalink.